Today’s highly stressful workplaces are causing an increase in employee burnout. 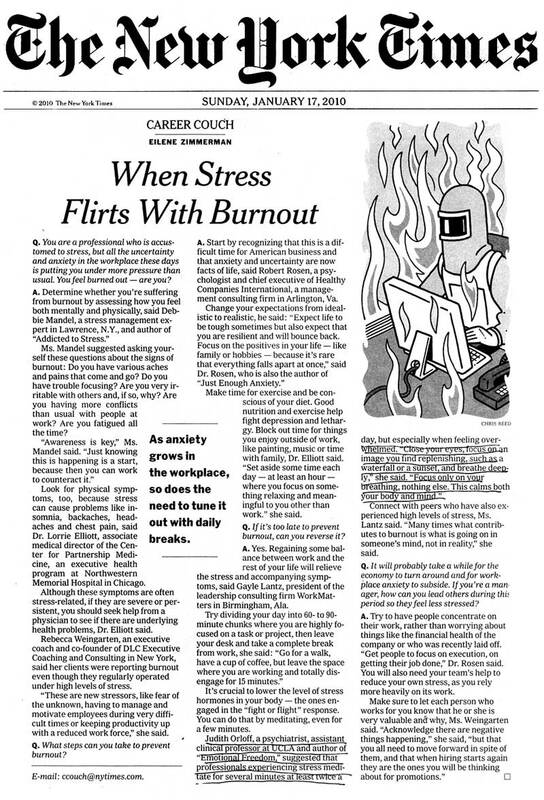 This stress-induced burnout can not only cause job fatigue, but also lead to physical symptoms like insomnia, headaches, chest pain, and anxiety. Stress can also keep us in constant fight or flight response which floods our bodies with cortisol and adrenaline. There is a way to lower the stress hormones in our bodies and it only takes a few minutes. Meditating for several minutes at least twice a day, and especially when you’re overwhelmed, can greatly reduce stress hormones in the body. Meditation also increases endorphins, which are natural painkillers. In this New York Times article, I share the benefits of meditating. It is an easy way for us to calm the mind and body when feelings of stress and overwhelm take over. Read the full article on New York Times here.